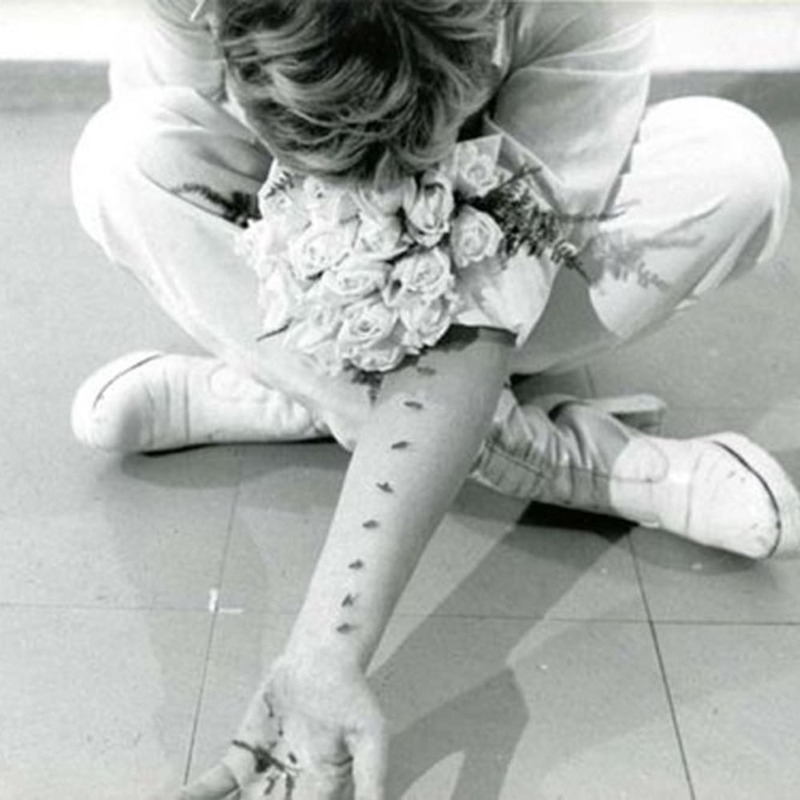 One of the most prominent figures in the international Body Art movement, the career of Gina Pane (1939-1990) encompasses performance, painting, sculpture and installation. She studied at the École nationale supérieure des beaux-arts in Paris and took part in projects developed at the Atelier d’Art Sacré founded by Maurice Denis. From the 1970s, Pane started to perform her ‘actions’ – a series of performances which addressed themes of pain and injury–including, among others, Azione Sentimentale (1973), Action Psyché (1974) and The Conditioning (1973), during which she lays upon a metal bed frame suspended over burning candles. In the 1980s and the 1990s, Pane moved to sculpture and installation, making works such as Partitions, which revolve around the memories of the body and of her previous performances. Her focus on the body resides at the centre of Pane’s entire career: it is a body marked, fragile and spiritual, as well as votive. In 2007, her work was included in the ground-breaking exhibition 'WACK! Art and the Feminist Revolution' at MOCA, Los Angeles (USA), cementing her historic contribution as a leading feminist artist. The artist participated at ‘Documenta 6’ in Kassel in 1977 and has had solo exhibitions in major museums around the world. More recently, her work was featured in important exhibitions such as ‘Gina Pane. Terre – artiste – ciel’, Centre Georges Pompidou, Paris, France (2005); ‘Gina Pane’, Museo de Arte Contemporáneo de Castilla y León, Leon, Spain (2016); and ‘Gina Pane’ at MART | Museo di Arte Moderna e Contemporanea di Trento e Rovereto, Trento, Italy (2012). Pane’s work is displayed in public collections including the Solomon R. Guggenheim Museum, New York, the Museum of Modern Art, New York, the Centre Georges Pompidou, Paris, and Musée d’Art Moderne de la Ville de Paris, amongst others.